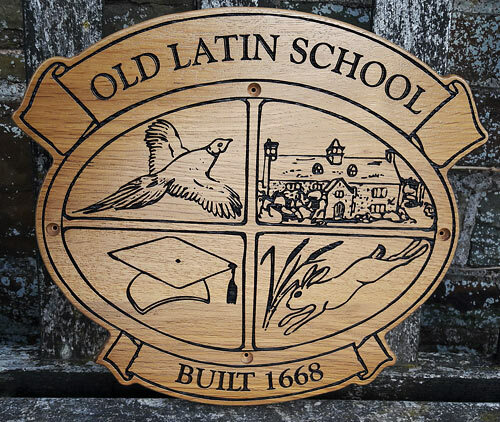 The English oak has a majesty all of its own, with wonderful variations in grain, texture and colour and often small pin knots and burrs are an attractive feature. It is a heavy wood and is strong and durable. Providing it is maintained it will last a lifetime. 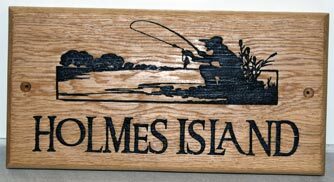 Smaller oak signs are lasered, larger signs are carved out by CNC router and the letters can be painted Black or Brown as standard. Other colours - Red, White, Farrow & Ball Stiffkey Blue, Farrow & Ball Purbeck Stone (light grey)or Heritage Green are also available @ £5. NB signs with white painted lettering must be treated with Osmo oil and not varnish. We can use most common fonts - for a selection CLICK HERE For some other fonts and ideas have a look at the Gallery page. 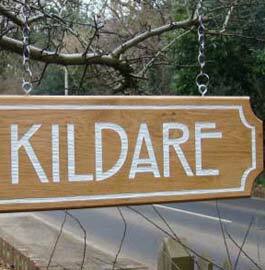 Our designers adjust the lettering to suit the sign, but if you have something particular in mind - send us your ideas. Proud White Lettering - Driftwood effect background. The Standard Sizes are on 4" 100mm high oak and 6" 150mm high oak in all UPPER CASE or Upper and Lower Case. On the 6" oak there is the choice of one or two lines. Also available are two or three lines on 9" 225mm high oak. These can be easily be ordered on our shopping cart. The alternative method is 'Made to Measure'. Here you choose the size of the timber which can be up to 27inches / 675mm high. The wording can be laid out any way you choose. The following sizes are our standard sizes and are the most cost effective option. For even more savings Order Online. 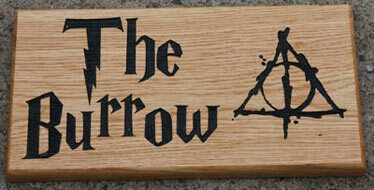 All the oak signs are made with your choice of font. 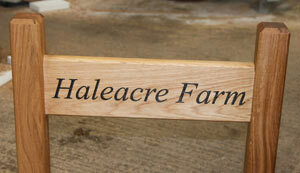 If you are looking for a slightly cheaper but similar sign have a look at the Chestnut House Signs. 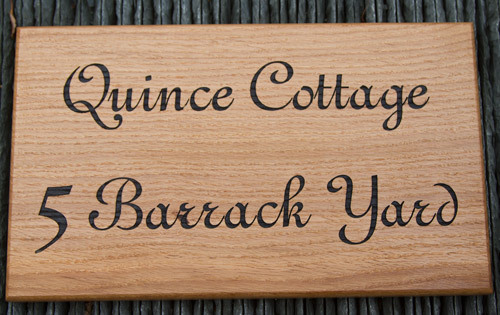 Large made to measure house sign 300 x 900 - Font Black Chancery. If none of the above styles suit your requirements or if you want a sign of a specific timber size use the chart below. If it is easier - then tell us what you require and we will send you a quote. Please note that all our oak over 9" high is at least 1inch (25mm) thick. 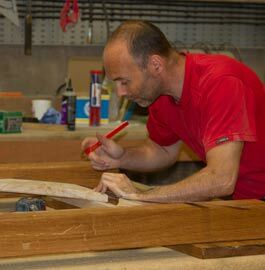 It is also the only timber we are able to obtain quarter sawn and although more expensive, this makes it extremely stable. This sign has been cut to a shape that matches the design. 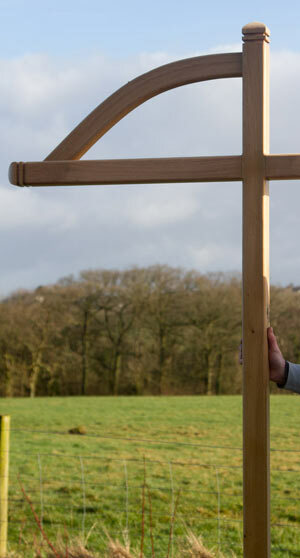 There are lots of options for hanging posts - Click here for full details. Made in the UK. 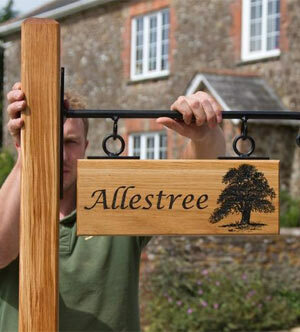 Our team at The Sign Maker looks forward to helping you with your oak house sign.